Although the word acid has been largely misunderstood we do use it here. Acid tastes is brightness in the mouth. 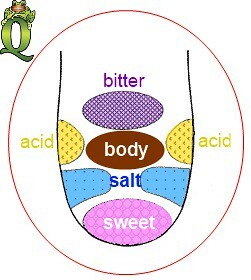 We have also added the Umami or body taste that is in the middle of the tongue. This is where body or strength is perceived. Acidity: High acid (or acidy) coffees have a sharp, pleasing, piquante quality that points up their flavour and gives them snap, verve, liveliness in the cup. Acidity may be high, medium, light, low, or lacking altogether in coffees, in which case the coffee tastes flat and dull. Acidity is characteristic of high-grown coffees. it is the brightness in the coffee See sour. Aroma: Refers to the odour of the prepared coffee beverage. It may be lacking, faint, delicate, moderate, strong, or fragrant (also called aromatic), and distinctive as to character. In cupping the Aroma is referred to as the odour after adding water, Fragrance before. Baked: A taste description given to underroasted coffee, or coffee roasted too slowly at too low a temperature, so that the flavour is underdeveloped. See green. Bitter: A harsh, unpleasant taste detected on the back of the tongue. Found in over-extracted brews as well as in overroasted coffees and those with various taste defects. Also a method use by cheaper brands to confusing the tongue in perceiving body, is to force bitterness in a coffee. Body: The tactile impression of weight and texture in the mouth. Coffees may be watery, thin, slight, light, medium, full, heavy, thick or even sirupy in body, as well asbuttery, oily, rich, smooth, chewy, etc., in texture. Easiest to detect in full-strength coffee. Burnt: A bitter, burnt flavour characteristic of dark-roasted coffees. Another method used to create fake body by cheaper brands. Buttery: Said of an oily body or texture in the mouth. Denotes full flavour and richness. Cinnamon: Underlying spice accent sometimes detected in the aroma of fine coffee, a flavour nuance. Not a common description. (Also, a term describing a very light roast). Clean: Opposite of dirty. Characteristic of all fine coffees. Does not necessarily imply clarity of flavour impression (see natural coffee and wild). Associated with washed coffees. Cocoa: Characteristic sweetish smell of completely stale roasted coffee. See stale. Dirty: An undesirable unclean small and taste, slight to pronounced. Dirty implies a defect, such as sourness, earthiness, or mustiness. See natural coffee and wild. Earthy: A highly undesirable dirt odor and flavour taint picked up by coffee when dried on the ground; also called groundy. See musty. Flat: A dull lifeless quality due to lack of acidity, commonly associated to stake coffee. Specific taste flavours may suggest, spices, chocolate, nuts, or something less complimentary – straw, grass, earth, rubber etc. Fresh: Opposite of stale. Applies to fresh roasted coffees, i.e. no longer than a week from roast. Fruity: Can be a flavour taint said to come from overripe fruit pulp. Or from a variant of Arabica found to produce this. Grassy: A flavour taint from use of swamp water for washing, or from improper drying. Also used as synonym for green and past-croppish. Green: A flavour taint found in coffee harvested before fully ripe. Hard: Opposite of sweet or mild; harsh. Description of Brazils between soft and Rio-y. not to be confused by the grading. Harsh: Crude raw taste; used to describe certain Brazils and robustas. Hidey: Smell of hides or leather from improper storage. Light: Used to qualify aroma, acidity, or body; a light coffee would be delicate in flavour. Mellow: Full, well-balance, satisfying coffee; implies low or medium acidity. See winy. Musty: A smell and taste taint caused by mildew; similar to earthy. 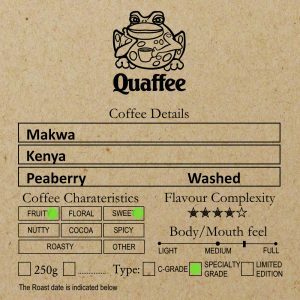 Natural coffee: Aroma and flavour characteristics of coffees processed by the dry method. They are often blander than washed coffees and may lack clarity of flavour and pointed acidity; some may have intense complex flavours and full, thick body. See wild. Neutral: A characterless, flavourless coffee, inoffensive to insipid; without virtue (safe for economical blending) but without defect. A desirable character in robusta and otherwise undistinguished Brazils. Past-croppish: Not to be confused with stale. Said of coffees that have deteriorated in the green state before roasting and thus taste as if from a past crop. See strawy and woody. Rancid: Extremely sour and very unpleasant. Found in tainted coffees. Rich: Indicates depth and complexity of flavour and full, buttery body; overused. Rio-y: A harsh, heavy medicinal or iodine flavour typical of the poorest grades of Brazil’s but encountered in other coffees as well. Said to be caused by allowing berries to dry on the tree. Rubbery: Burnt-rubber odor characteristic of Robusta. Used to create fake body. Soft: Low-acid coffees are described as soft, mellow, sweet. Sour: Not to be confused with acidity. A distinctly sour, rank, or rancid taste is a defect, often due to improper processing. See wild. Spicy: Said of fine aroma or flavour suggestive of spices. Stale: Roasted coffee that has faded in quality after excessive exposure to air. Aroma of stale coffee changes from flat to rancid and finally to cocoalike; the flavour of stale coffee changes from bitter to rancid and tastes cardboardy. Not to be confused with past-croppish. Strawy: Characteristic scent of past-croppish coffees; hay-like. See woody. Strong: Term used to indicate intensity of either defects or virtues (as in “a strong, sour taste” or “a strong, fine aroma”). A strong-flavoured coffee is therefore not necessarily a fine-flavoured coffee. Sweet: Said of a smooth, palatable coffee, free from taints or harshness. Also soft. Thin: Said of coffees with watery body and lack of flavour; typical if low-grown coffee. Wild: Coffees with extreme flavour characteristics, or odd racy, tangy nuances in aroma and taste. Usually applied to natural coffees. These characteristics may be intriguing or undesirable. See dirty. Winy: Sometimes used to indicate thick body and mellow quality, but also used to denote a sappy, vinous acidity. Characteristic of certain fine coffees. Woody: A flavour taint caused by over-lengthy storage in warm wood sheds; also characteristic scent and taste of old, past-croppish coffees.